We live in a 2 bedroom apartment with 6 people. Perhaps some of you live in tighter space than we do, but even so, it can still be a trick for us to fit ourselves and all of our belongings into our home in a comfortable and non-chaotic manner. We may have moved overseas with only a few bags, but almost 9 years later, we’ve had plenty of time to acquire things that now battle for precious and limited shelf and closet space. I won't win any awards for style or decor on my kids' bedroom, but we do have 4 kids sharing this one room and we've managed to find ways to keep it a manageable and comfortable place for them to enjoy. They are also mostly able to maintain its' order themselves. 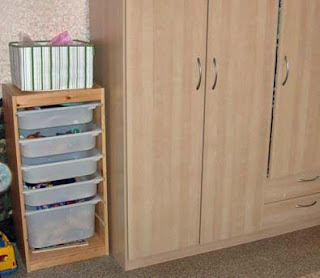 A major area that needs constant de-cluttering is our kids’ room. We have all 4 kids in one not-so-large bedroom. I feel like I am constantly sorting and getting rid of toys that don’t get played with to try to keep their room from being overrun with clutter. My kids themselves sometimes reach the point where they are begging to get rid of things so their room will be more peaceful. So, since I bet a lot of you are in the same boat as our family, I thought we could share ideas about taming clutter, particularly in our kids’ rooms. I'm not an expert on this, but we've needed to be attentive to this issue since there are a lot of us and not a lot of room in our home. Here are some of my thoughts about keeping kids’ possessions manageable if you happen to fight this same battle. I hope you'll share yours too! 1) Kids really don’t need a ton of toys. Really! Over years of analyzing what my kids actually play with, I am pretty sure that my kids would be perfectly happy if they only had blocks to build with (like Duplos and Legos), a few stuffed animals each, a few baby dolls with clothes and blankets, a doll stroller, trains and tracks (Thomas or Thomas-like generic version), games, arts and craft supplies, and books. Actually, I bet they would be perfectly fine with less than this, but these are what they regularly play with now and make up the bulk of their toys. All of the other little toys that they have rarely get used. As a result of observing this, we’ve learned to freely pass along toys that the kids don’t use. It makes them (and me!) feel less stressed when their room looks nicer. It also makes cleaning up so much easier and faster for them, and they don’t miss the toys that we give away. They are able to easily clean up their room on their own every night, meaning that we can start each day with a tidy room and that their things do not become a burden to them. We still have more toys than we need, but we've definitely tamed what could have been! 2) Toy rotations are great! We have buckets of toys that slide in and out of our small Ikea toy organizer. We have more buckets than shelves for the buckets, so some of them stay in the kids’ closet. When they tire of the toys that they have out, I ask them to fill up a bucket or two that they would like to trade in for whatever is in the closet. It revives their interest in some of their toys if they are put away and then brought out after some time. The short storage area contains some of the storage bins that we rotate. 3) Suggest non-toy gift ideas to friends and family who want to show your children love. Living overseas, there are fewer ways that our family and friends can show love to our kids, which makes gift-giving very important, but because of this, our kids may often receive more gifts from friends and family than they perhaps would otherwise. You may want to try to think of and share gift ideas that family and friends can give to your kids that won’t result in loads of toys for every holiday, birthday, and in between. Perhaps they can send a special picture book, or give a coupon for a special outing either for something that you can do in your host country or home on furlough, give the gift of Skype story times or craft/music lessons or game time with a loved one… Get creative! The point of gift-giving is to show love and build the relationship between the child and family member or friend. Of course sometimes toys are the perfect thing for this, but other times there are non-toy options that might be even more meaningful. Those are just a few ideas on how to tame clutter in kids’ rooms. I would love to hear your thoughts and ideas too! Do you battle to keep your kids’ room from being over-run with toys? If you could make a short list of the most entertaining toys, what would you recommend? Do you have other techniques to share on keeping their rooms in order? What sorts of principles guide you as you consider how to manage the number of possessions that you own? We use those IKEA tubs, too! So far we've had a 1-tub-out-at-a-time rule. When they want to move on to another activity, the tub gets packed up and put away before another one comes out. It's worked pretty well to keep the toys under control. I like the idea of giving toys away occasionally, too. We gave away most of our son's toys before we left for the mission field. The 2 biggest favorites for him have been Legos and Squinkies. I love that the squinkies are small enough to bring with him everywhere. Plus he was showered with them at his last birthday before we left because they stopped making them and were really low clearance prices. Sadly, he doesn't get nearly enough time to play. He comes with us all over Montreal as we serve and go to meetings. We are working on freeing my time so he can spend more time doing homeschool and just being a kid. We have been missionaries for just about 6 months now and managing priorities and setting boundaries have been among our most difficult issues. So fun to see these pictures of your life, Ashley! Great tips. Our list of toys would be similar to yours, with the addition of Playmobil, which our kids love and play with together a lot. I'm wondering -- when playing, do your kids stay in their room or do they play in other parts of your apartment? There is more space for our kids to play in our living room, but we have people stop by so often that it gets a little stressful to have toys in there. 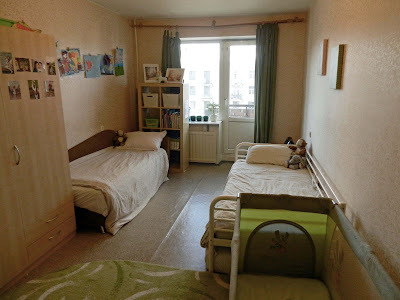 One thing we have done is designate a part of the hallway as a play area for them (it's a very long hallway), so that they can have some other space to play. We have grandparents who generously give a lot of gifts and it's hard to fight clutter! This year, I was feeling overwhelmed by it and asked if they could give an "experience" rather than more toys. So, instead of birthday gifts, we had a day at the beach!